These Whole30 Breakfast recipes are some that I used to get me going in the morning and allowed me to see that eggs can be cooked in more than just one way! Even though my Whole30 is done, many of these breakfast recipes have become favorites for both me and my husband. 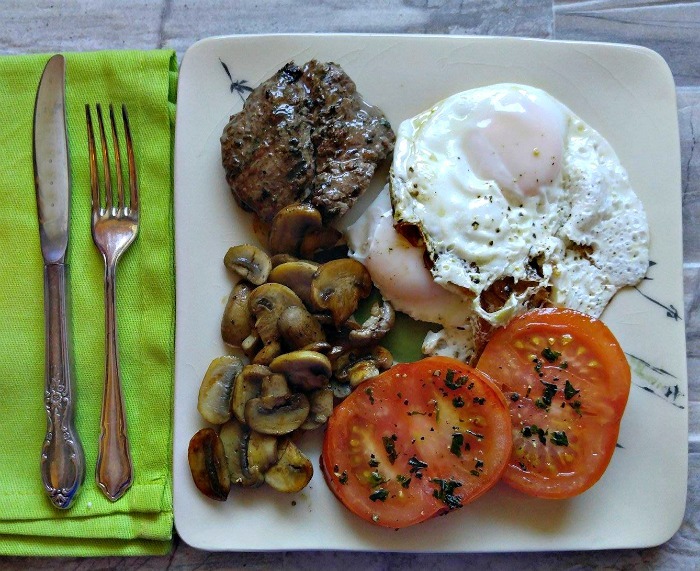 If you have been doing a Whole30, you will know that breakfast can be a challenge. (By about day 14, I didn’t want to ever see another egg!) This post will give you some other options for variety in your diet. I have just finished my Whole30. For those of you who don’t know what this is, it is basically a 30 day reset where certain food groups are eliminated from your diet that might be impacting your health in a negative way. The foods eliminated include added sugar, legumes, grains, dairy products, and alcohol. Foods containing carrageenan, MSG and sulfites are also a no no for the 30 days. The bulk of my diet for the last month has been meat, chicken and fish, nuts, eggs, healthy fats, vegetables and fruits. The main reason that I did the Whole30 was to find out which foods that I have been eating have caused inflammation in my body that resulted in joint and skin problems for me. I am glad that I did it and have come away from the program with many improvements in my health and lots of “wow, I didn’t know this food reacted this way for me!” moments. I found the program easy to follow and enjoyed the new meal time ideas that I came up with. Breakfast, was my biggest challenge. 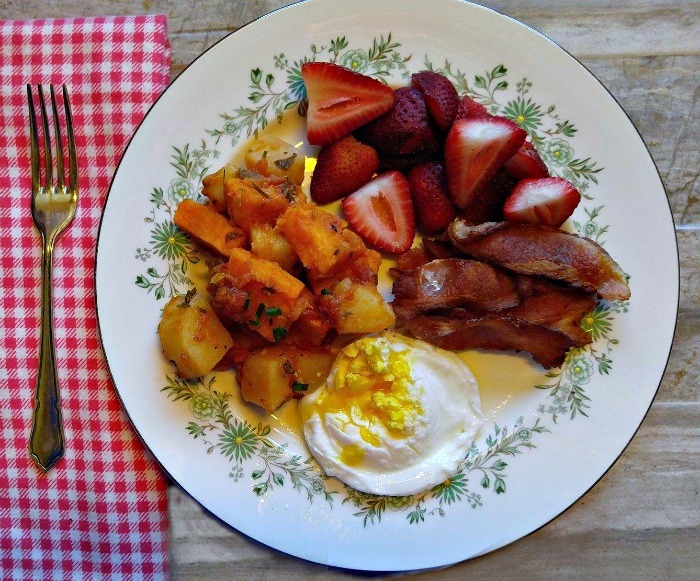 Here are some of my favorite Whole30 Breakfast Recipes. All can be made in less than 30 minutes and are tasty and give some variety to the start of the day. 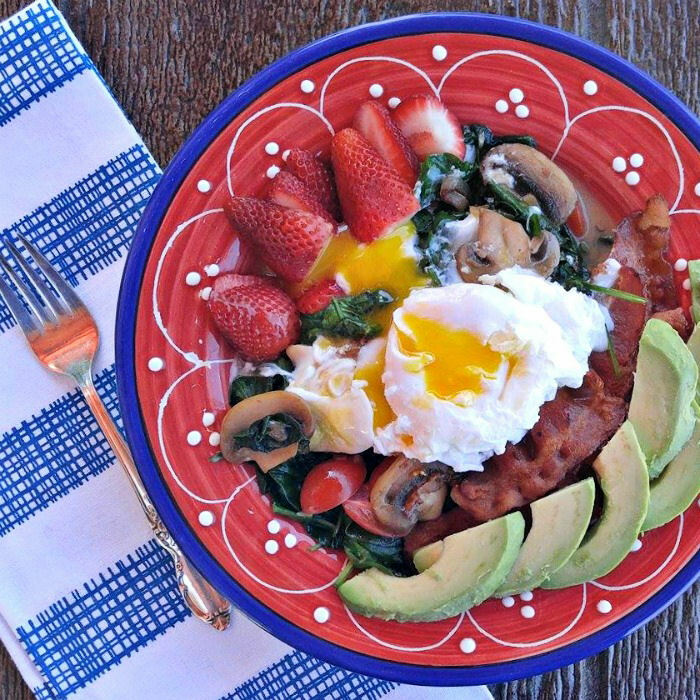 Whole30 Breakfast Recipes to Start you Day on the right foot. The biggest thing that I discovered with these breakfasts is how FULL they made me. I was used to grabbing a yogurt in the morning and calling it good. These breakfast recipes call for a big plate of food. There were some days when I looked at my watch at 2 or 3 pm and thought – “goodness, it’s way past lunch and I’m not hungry at all.” Starting the day with a hearty breakfast made it easy for me to forego snacking all day long. 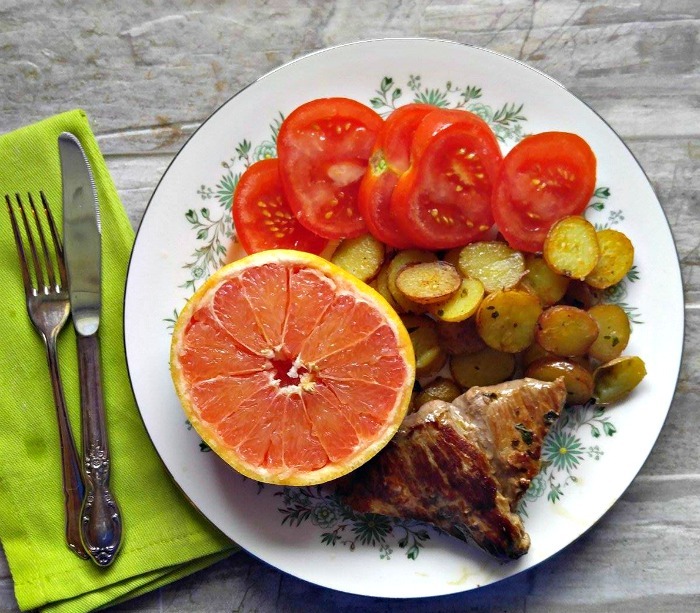 If you are doing your Whole30, try one of these ideas for variety in your morning menu. This was the first cooked breakfast that I tried on my Whole30. I was trying to figure out a way to serve poached eggs without using bread. These sweet potato stacks and sauteed spinach did the job nicely and I loved this recipe. 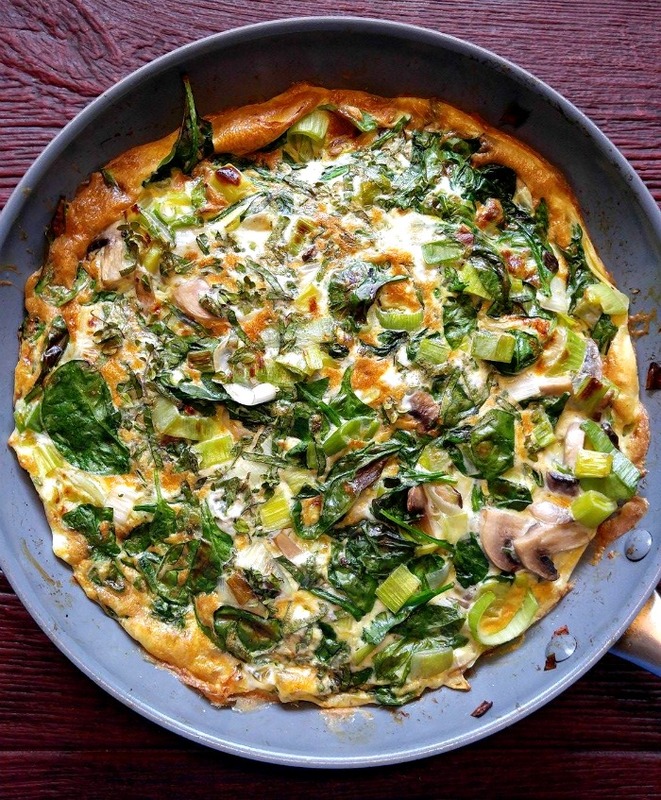 I’ve never been much of a fan of leeks, but that all changed with this spinach and leeks frittata. It was super easy to make and we both loved the flavor. This one is a keeper for sure. About a week into my Whole30, I found that I was getting tired of eggs and starting to miss a bowl of something in the morning. Cutting out grains made this a bit of a challenge, but this Whole30 Breakfast bowl was my answer. 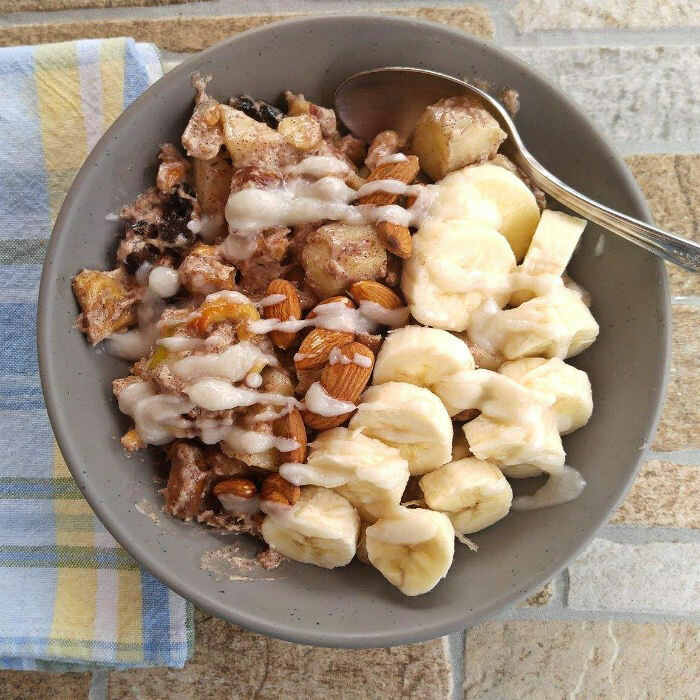 It was a combination of apples, bananas, dried fruit and almonds all topped with a splash of my new favorite treat – coconut butter. (affiliate link) This bowl was a great addition to my collection of Whole30 breakfast recipes. 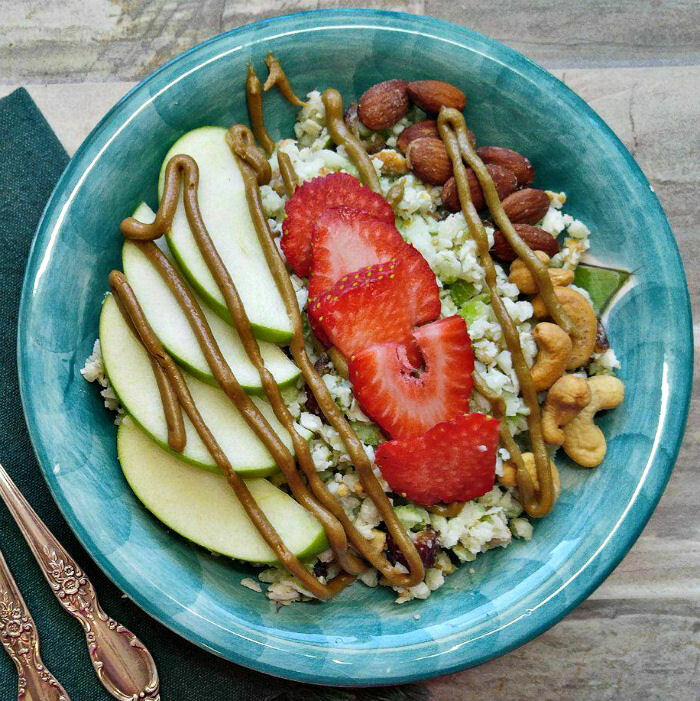 Note on this recipe: even though this breakfast bowl has only Whole30 ingredients, it is rather sweet and one of the purposes of the Whole30 plan is to cut sugar cravings, so it may not fit the aim of the program if this is a big issue for you. Getting a variety in your breakfast while following Whole30 means redefining your idea of what makes a breakfast. 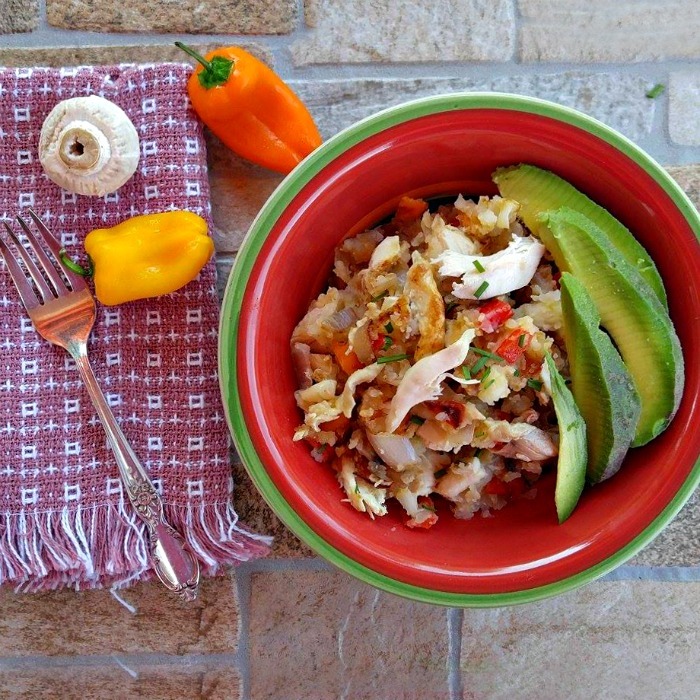 This breakfast chicken hash bowl is a recipe that I adapted from one of my mother’s Thanksgiving left over dinner ideas. It was delicious, quick to make and very filling. Who says you have to have just eggs or cereal for breakfast? It’s hard to believe that I lost 15 pounds in the last month eating breakfast like this, isn’t’ it? No recipe for this one. I just woke up and used potato left overs from the night before to make hash browns cooked in clarified butter. I added from home grown garden tomatoes, a piece of steak and half a grapefruit. This was another full until mid afternoon breakfasts! By about day 21, I seriously wondered if I would ever look an egg in the eye again! 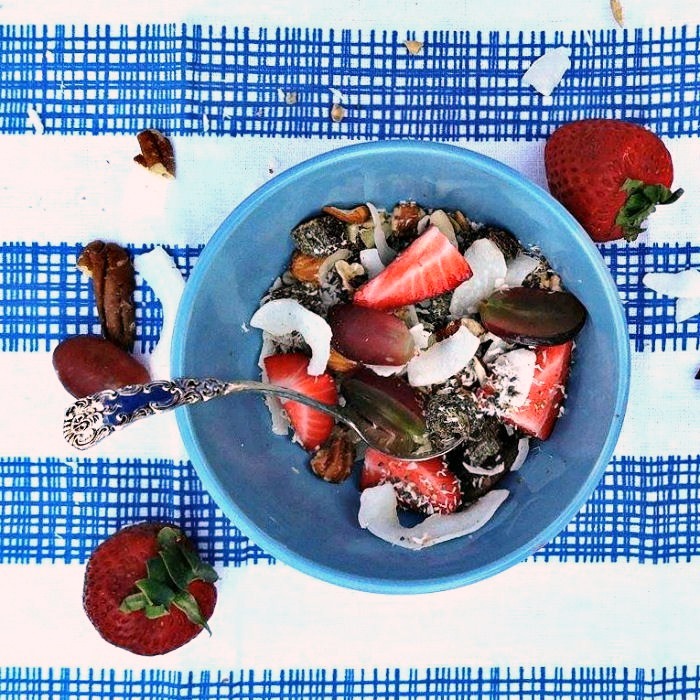 This grain free muesli was my answer. It is a combination of dried fruit, grapes, strawberries, unsweetened coconut and nuts. I added a splash of coconut milk and had my “cereal” again. It is definitely not as sweet as a normal muesli, but managed to satisfy my desire for cereal. 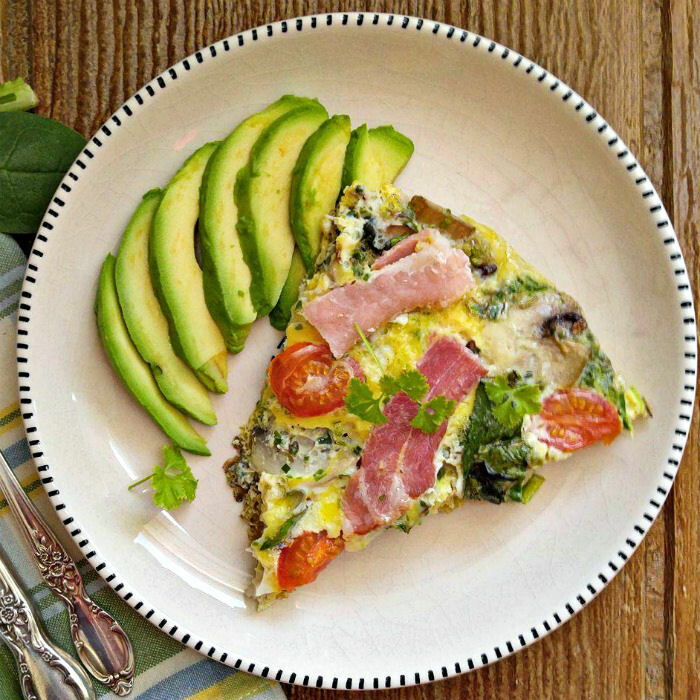 This Whole30 bacon frittata with mushrooms and tomatoes is quick and easy to prepare but tastes like a dish from a weekend brunch café. It’s very light on calories and also filling. Back to a traditional breakfast look. This time I used my recipe for caramelized mushrooms on a bed of garlic spinach to layer bacon and poached eggs. Strawberries and avocado slices finished the plate. I liked these caramelized mushroom so much that they got used a few days in a row! This time I added poached eggs, steak and some fresh tomatoes lightly grilled and garnished with home grown basil. I used fresh herbs a LOT during the last month to add extra flavor to the foods. My final breakfast recipe was for this tasty bowl of breakfast hash browns. I was getting good at using left overs in the morning by this point in my Whole30. They made breakfast fast and easy. 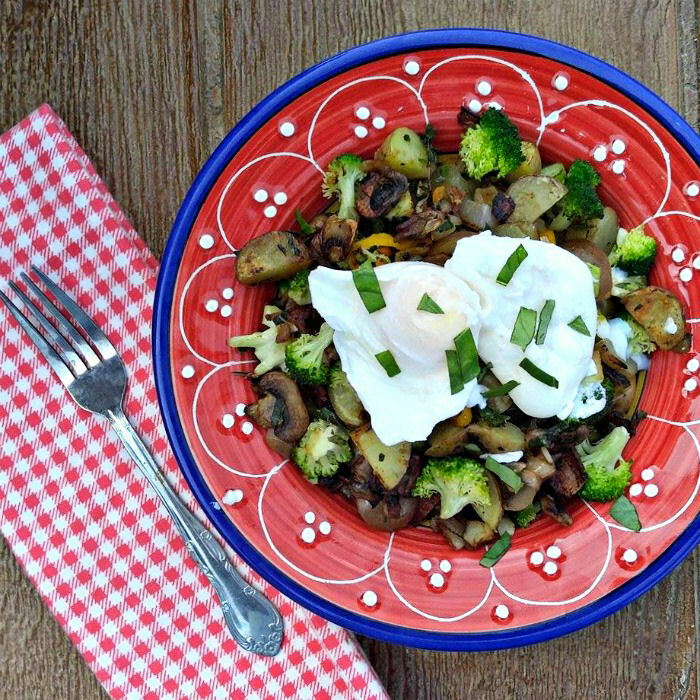 Potatoes, mushrooms and chopped broccoli made a great base for poached eggs and a different look to my plate. Final thoughts on my breakfast on my Whole30. Am I tired of eggs? Heck yes! But I did discover that my reluctance to eat them was not because of the eggs, it was because of the need to COOK first thing in the morning. I just don’t enjoy starting my day with a frying pan, unless it is the weekend. Who knew? I really am a grab and go morning person. I got better at using left overs as the month went on. I also made my husband two Paleo recipes that I will be trying on my food reintroduction. Paleo Banana bread and Paleo banana nut muffins. Both of these qualify as a breakfast on the go. Whole30 doesn’t allow baking this sort of food even with compliant ingredients, but Paleo does. Hubby liked both of these recipes, so I am sure they will make it on my plate when I reintroduce gluten free grains. 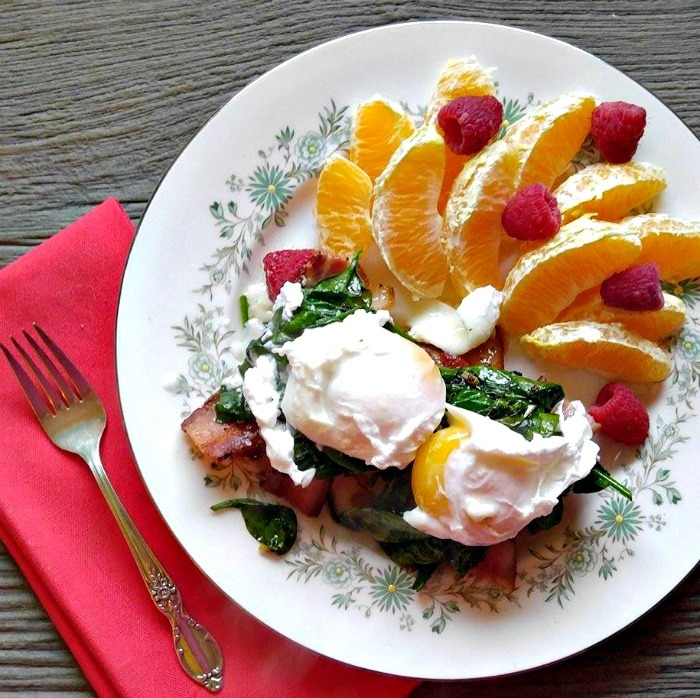 Do you have some favorite Whole30 breakfast recipes? Please share them in the comments below.